Some of my fondest memories are wrapped around watching the giant ball drop on New Years Eve. Don’t we all love counting down the seconds until the new year begins? There is something special about ringing in a brand new year full of hope and new beginnings. That’s why I love making all the sparkly and shiny New Years Eve party decor and foods. 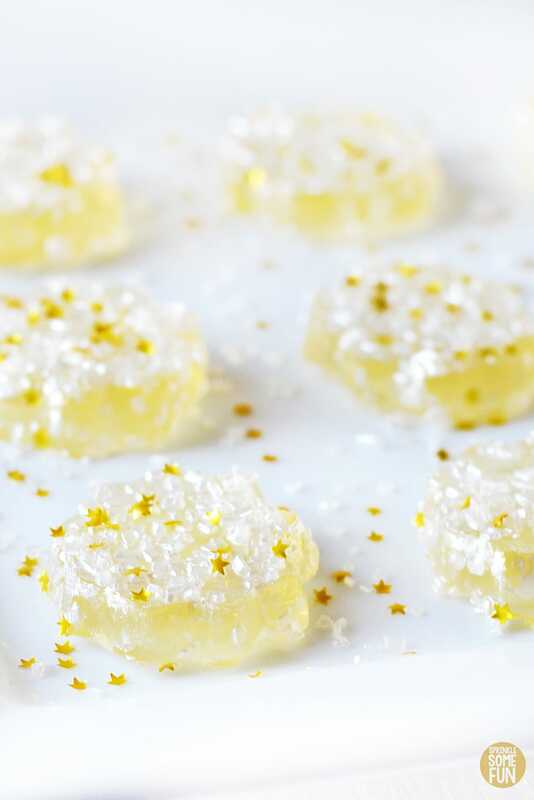 These Sparkling Jello Jigglers are perfect for a New Years Eve party! The bubbly juice inside is a nice fizzy addition to traditional jello jigglers! Not many people I’ve asked remember that Jello made sparkling white grape jello back in the 90’s. Do you remember it? It was always my favorite thing to make for New Years and I am surprised it that they don’t make it anymore. I knew I needed to try and recreate it for New Years Eve and so I made my own version. 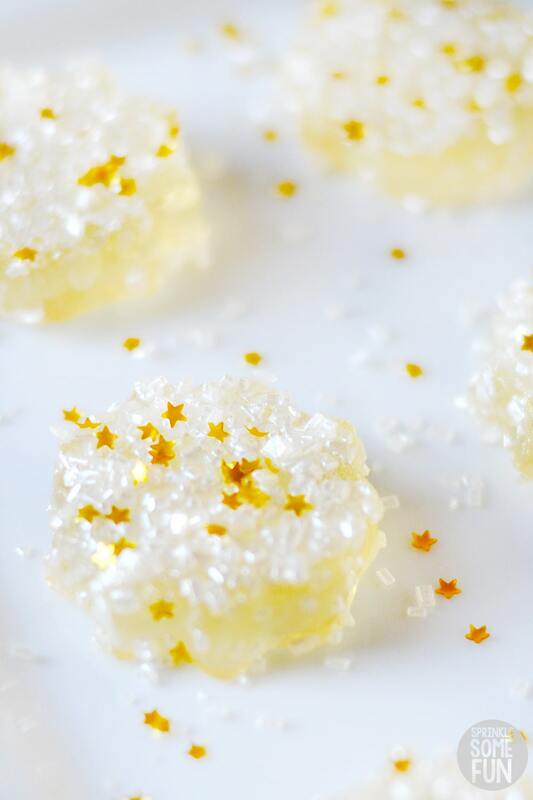 Sparkling Jello Jigglers make such a beautiful dessert that you can be dress up or dress down depending on the sprinkles you choose. 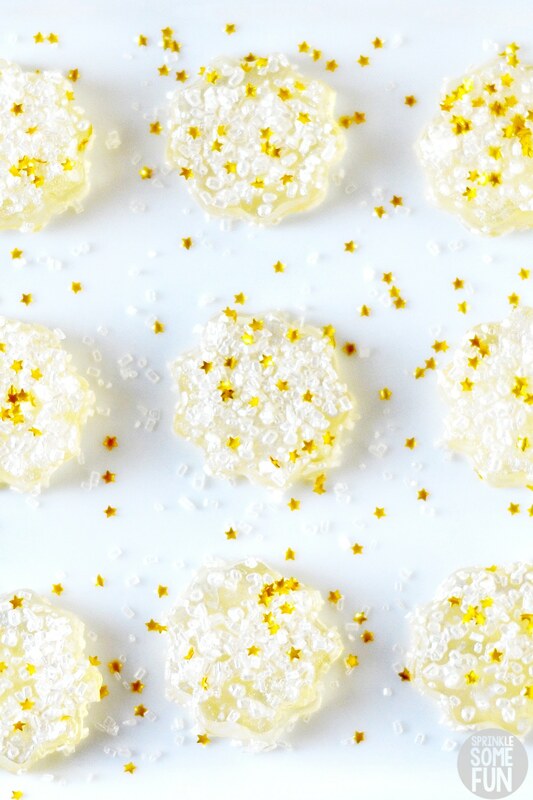 You could even leave the sprinkles off and they will still look great. These are definitely a step up from traditional jello jigglers with the fizzy juice inside! 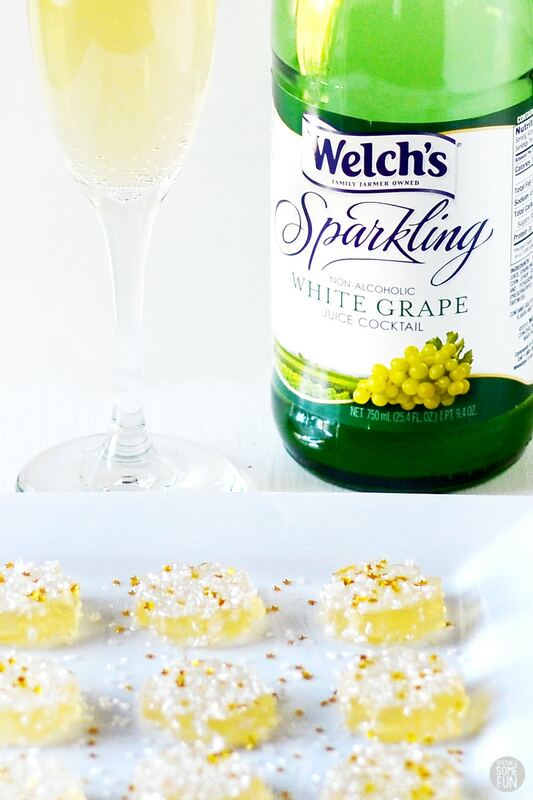 We always have little ones at our house and so these sparkling jello jigglers are made kid friendly with sparkling white grape juice instead of champagne. I’ve have not tried these with champagne, but I am sure you could substitute with it if you like. I really like the white grape flavor for these, but these would also taste great with other sparkling juice flavors too! 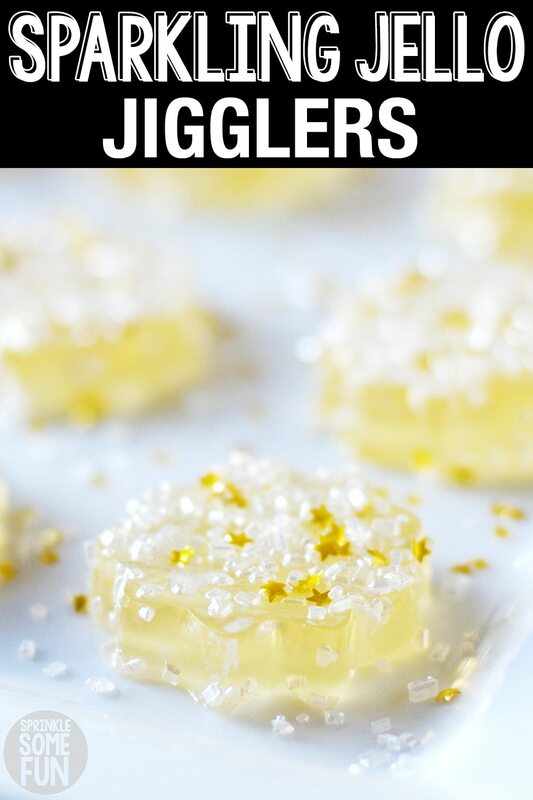 I used gold stars and iridescent sprinkles to top these jigglers to make them even more festive. The sugar sprinkles will dissolve a little if left on the jigglers for more than 15 minutes or so, but you can just sprinkle more on if that happens. You can also change up the sprinkles to any that you like. I think pink, silver or gold sprinkles are always perfect for New Years! Jello jigglers are just like jello, but they have less water so that they are cuttable into different shapes and sizes. They will easily hold their shape when cut and you can handle them with your hands. Have you ever made Jello Jigglers? The process is the exact same here, but we are subbing all of the water for sparkling juice. Once you’ve cooked the ingredients in the microwave then you let the jello set up in the refrigerator. Once it is a gummy like consistency then you cut the jigglers out with cookie cutters. I used a star shape, but you can use any shapes that you want. You can also forgo using a shape to cut them and just cut out little squares. Either way they will be super cute. I can’t believe that we are already heading into a new year! 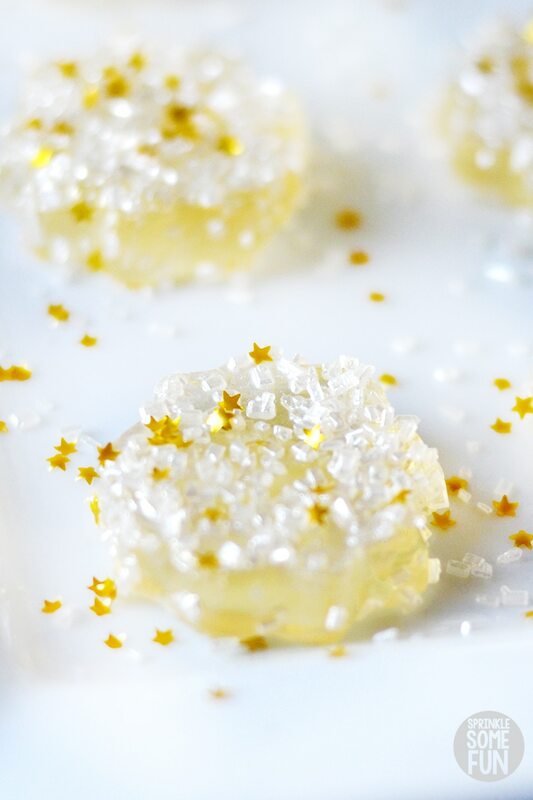 To ring in the New Year I love having super fun and easy treats to share like these Sparkling Jello Jigglers. 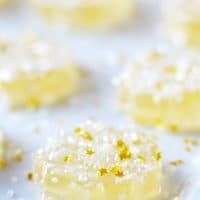 With just a little Welch’s Sparkling White Grape Juice, sprinkles and some Gelatin you can make some fancy flavored jello jigglers that are sure to please kids and adults alike! 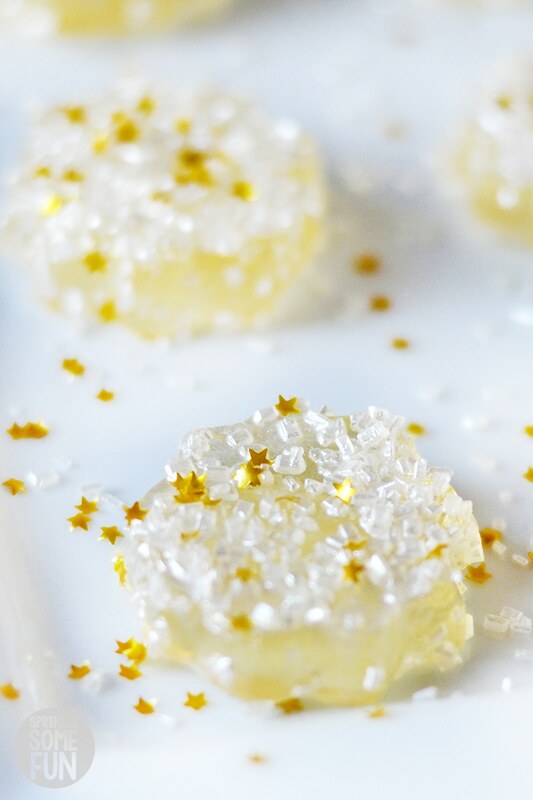 If you can make Jello then you can make these! 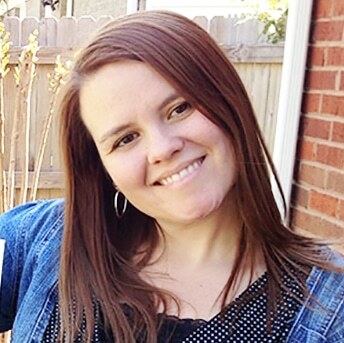 So easy and super fun! 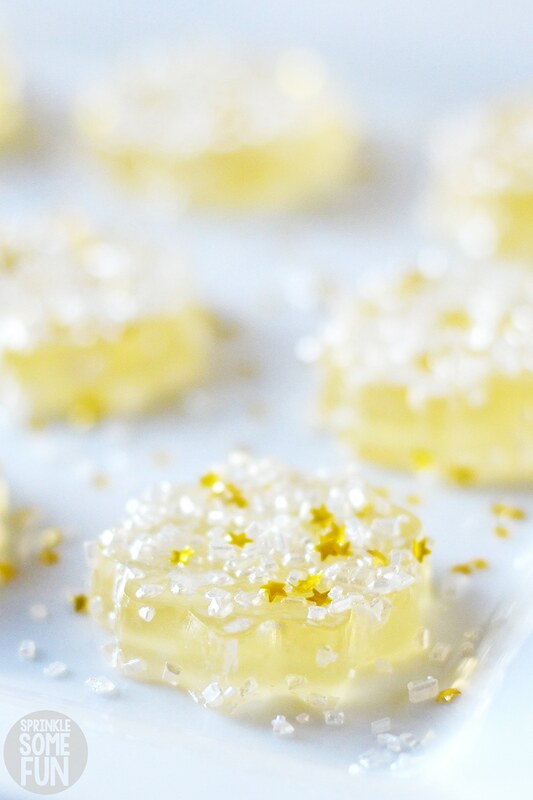 If you love this recipe for Sparkling Jello Jigglers then please give us a five star review below! 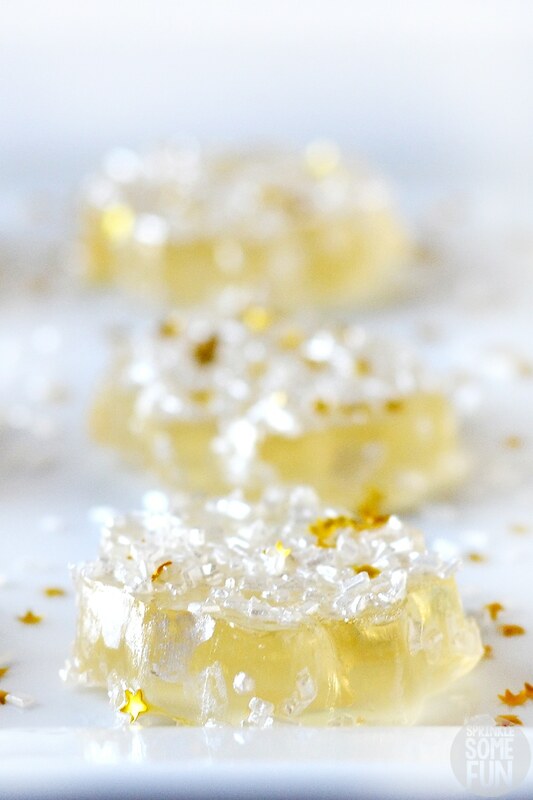 These sparkling Jello Jigglers are so fun to make for a new years eve party! Mix gelatine, sugar and the sparkling white grape juice in a medium microwave safe bowl well and let it sit for 3 minutes. Microwave on high for 3 minutes until everything is dissolved. Pour into an 8 inch square or round cake pan (glass or ceramic is best) that is sprayed with oil or cooking spray. Refrigerate until completely set. take a cookie cutter (i used a mini flower) to cut out the jigglers. There will be extra jello leftover which you can chop up and serve. How cute! These look so good! Have you tried it with champagne? … Wondered what the recipe might be. It might work… I’ve never tried it! Very festive! I’m sure adults would love it as much as kids! Such a great idea! I may have missed this for New Year but it will work for my daughter’s birthday for some tasty treats! Does this work with sparkling apple cider? At what point do you add the sprinkles? Just before serving? Don’t want them to disolve if added too soon.